Well not really, that's the name of the Shellac nail polish my friend and I got. If you've been living under a rock and don't know what Shellac nail polish is, it's gel nail polish that lasts for 2 to 3 weeks and has to be soaked off. I like to get it in the summertime to allow my nails to grow without peeling like they usually do. 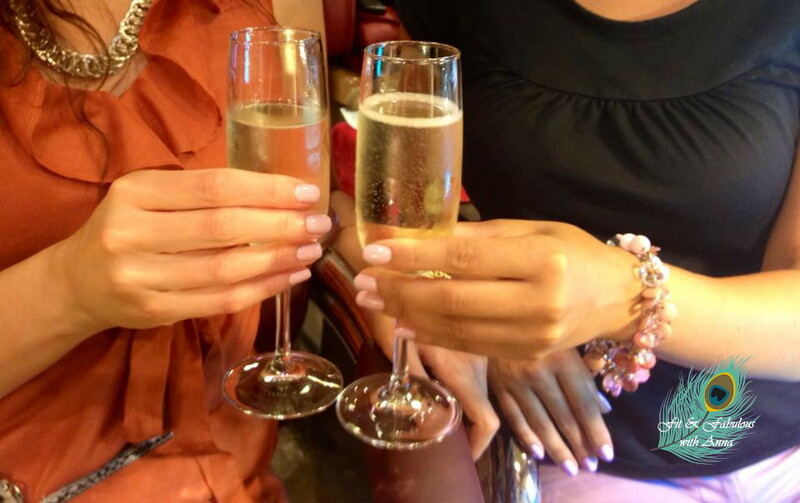 It's also great for vacations because you don't have to worry about chipped polish while traveling! You can get it done at a salon or buy the kit to do at home. See the polish doesn't dry on it's own, you have to put your hands underneath a UV lamp so be sure to put sunblock on your hands beforehand. The great thing is it dries must faster than regular nail polish, no worried about smudging it soon after it's done. I'm thinking about doing an accent nail, glitter maybe. I have to say I'm a sunscreen addict and have been putting sunscreen on my face daily since high school to prevent pre-mature wrinkles. I often see Japanese tourists wearing white gloves in the summertime and thought you know they're probably on to something. My mother had the age spots on her hands lasered off and said it was very painful! So I started wearing sunblock on my hands everyday as well. Growing up I was partial to using Hawaiian Tropic sunscreen, just seemed like a fun brand with their events and competitions plus I loved the coconut smell! But recently I switched to Neutrogena because they use Helioplex which is a breakfthrough technology in sunscreen protection. Until recently it was only available in Canada and Europe and let me tell you I was already looking into where I could buy it online until Neutrogena annouced they were going to bring it to the US market since it finally got FDA approval. The FDA also created new sunscreen labeling guidelines preventing companies from using the words "waterproof or sweat-proof labels" on their label and instead have to state how many hours someone could be in water. For example it could say 80 minutes until you have to reapply, so make sure you look for that on new sunscreen bottles. But you should be reapplying sunscreen every 2 hours anyways. Consumer Reports tested sunscreens for their July 2013 issue and found that some products don't meet the SPF claims made on the bottles. First off you shouldn't use anything below 15 SPF because it won't protect you from skin cancer or aging and anything over 50 SPF isn't any stronger than 50 SPF research has found. The brands with the top scores after testing were: Coppertone Water Babies, Hawaiian Tropic Sheer Touch SPF 30 and Coppertone Sport High Performance SPF 30. Surprisingly Neutrogena Wet Skin SPF 45+ scored poorly. One of the biggest sunscreen mistakes I see people making is applying sunscreen once they arrive at the pool. For best protection you should apply your sunscreen 30 minutes before you go outside, if you apply sunscreen in the sun it just melts off, it needs time to be absorbed into your skin. Sunscreen bottles should be changed every two years because the active ingredients do expire. These two rules I've been following for years. Don't forget sunscreen for your lips! If you do get sunburned, keep an after sun lotion with aloe at home, my favorite is Burt Bee's. 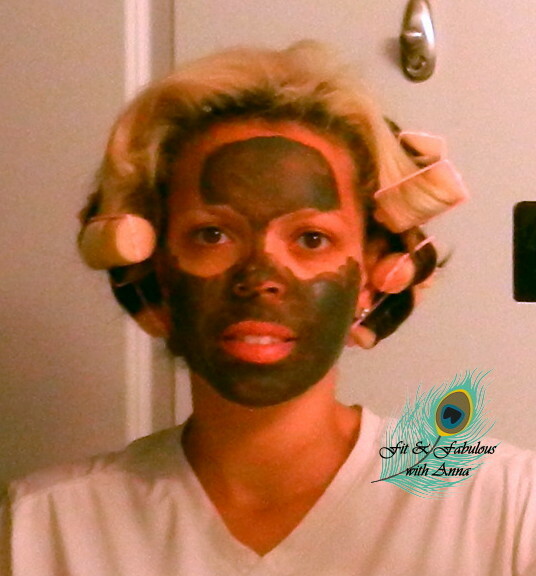 Then do a moisturizing facial mask. A game changer in the suncreen world is Color Science who makes a facial powder called Sunforgettable that has sunscreen in it! You might have seen it featured on the Today show last week. If you look at the picture from yesterday's post you'll see I use their Mineral Finishing Powder to absorb oil on my forehead. Hidden on Groupon's website yesterday was this awesome deal, probably won't last long. I was browsing through the many deals they were offering and stumbled upon it. Guess they didn't want to highlight it. I can't wait to see Sandra Bullock's new movie, have you seen it, is it funny? 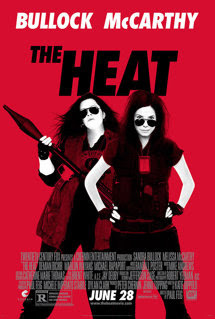 Update: I saw the movie and as usual Melissa McCarthy (Jenny's McCarthy's cousin) was hiliarious in the movie! I loved Sandra's subtle highlights. Alright so Operation Camp Gorgeous is in full effect! I think this pic of me in my facial mask will be the hottest thing you see all day, I kid, I kid!!!! hahahaha! I always hear that having oily skin is a good thing because it means you won't have wrinkles for a long time, but in the meantime who wants their face to look like they slathered it in baby oil? lol I pretty much try anything the dermatologist has to offer, I've had microdermabrasion, chemical peel, silk peel, Isolaz,Vitamin C masks, I use gadgets, you name it I've done it. 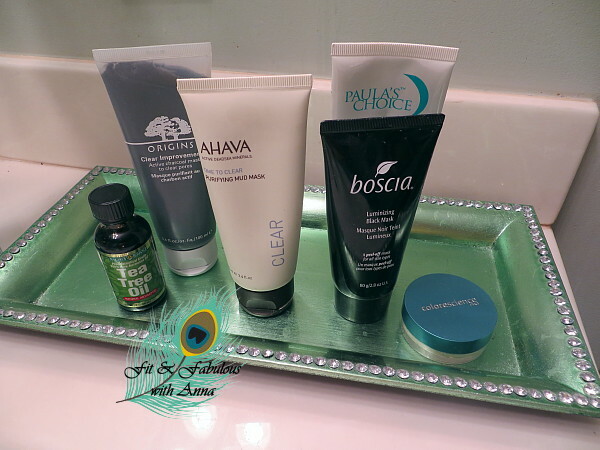 Here's my collection of clay/charcoal masks that help reduce oiliness: Origins, Dead Sea Mud, Boscia which is a peel off mask, and Paula's Choice. I'm really into natural remedies so I started using tea tree oil for the occasional breakout, it's a great antiseptic. I even tried the Oil Cleansing method to clean my face, the idea behind it is oil dissolves oil. So I washed my face with a mixture of olive oil and castrol oil, crazy huh? lol It works because oil does not cause oily skin, oily skin is result of hormones and trapped bacteria. When your skin's natural oils are removed it compensates by creating more oil. I didn't last too long with the Oil Cleansing method because it was too labor intensive. First I had to keep my oil mixture in a small bowl on my bathroom sink which I like to keep completely empty for aesthetic reasons. I looked into pouring it into a bottle but you know me I couldn't just do that with out designing and printing out my own label! lol Then I thought this is way too work for a bottle only I will see so that idea got scrapped. Plus you remove the oil with a hot washcloth to steam your face, so it just became too much of a hassle for me. 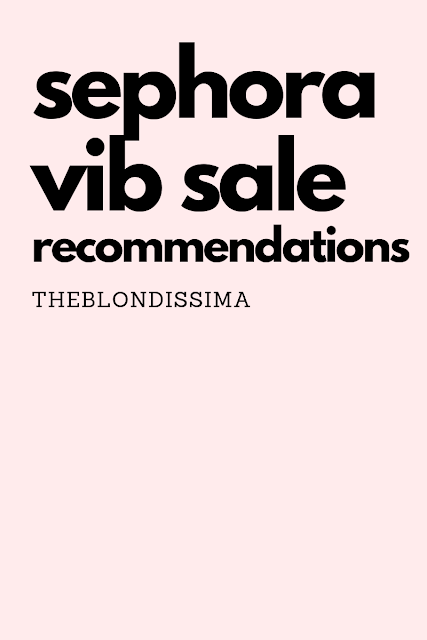 Then I researched it some more and found a blog saying don't use olive oil or castrol, instead use 5 other oils, well if that's the case I might as well just drop money on a prepackaged mix from Bobbi Brown. I'm too lazy to play scientist mixing multiple oils to find the right mix for me. lol If I wasn't I would be making my own thyme toner and tumeric masks. But if you're not, I wanted to share some other methods you might not have heard of. I love Trader Joe's, I find so many unique and healthy items at great prices. I saw TJ's had a jar of Thai Green Curry Simmer sauce so I thought I'd give it a try. I'm usually let down by pre-made sauces, but this one was different! It was spicy, creamy from the coconut milk, and I could really taste the lemongrass in it! I made a big batch for lunch for the whole week. To make it was super simple, quick and easy to whip up! You can use any vegetables you like, even frozen vegetables. 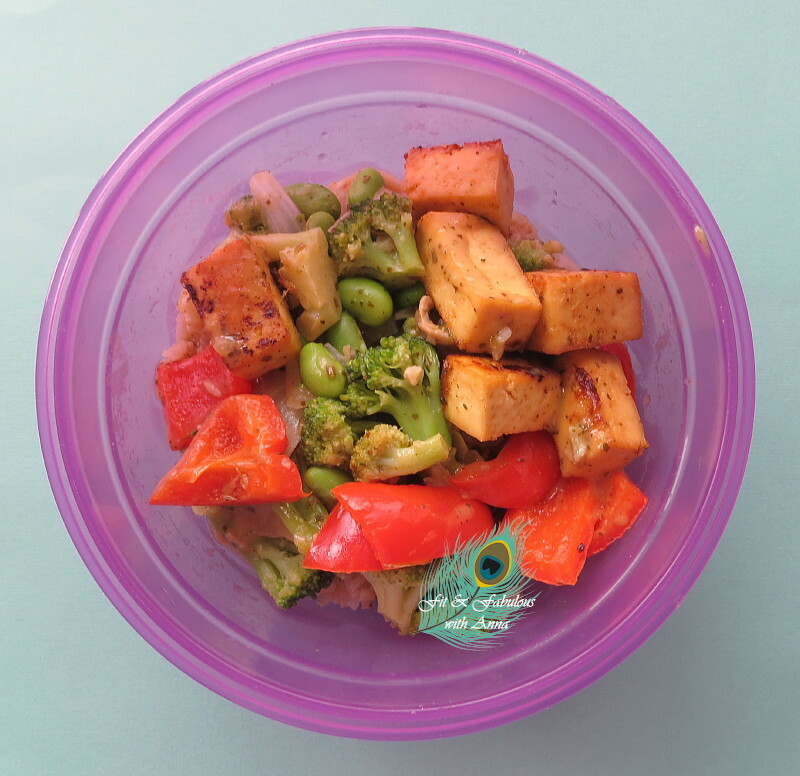 I used broccoli, wild mushrooms, red bell pepper, onion and garlic, then added some baked tofu and TJ's edamame shells for protein. I served it over TJ's brown jasmine rice which tastes just as good as white rice. I measured the rice before I cooked it to make sure I was making exactly 5 servings and divided it up evenly into 5 tupperware containers. One serving is 423 calories, 22 grams of protein, 7 grams of fiber. I used the whole jar of sauce but you could lower the calorie and fat count by using less. Just be sure to not microwave it on full power when reheating to retain the flavor. Don't have time to workout? Do you want the results of Insanity but in half the time? Yesterday Beachbody released their brand new workout system from the creator of Insanity and Hip Hop Abs called T25. Shaun T, creator of Insanity, experimented for the last year to see if he could create the same kind of results you'd expect from an hour-long program, in under 30 minutes. The result is FOCUS T25. If you focus your intensity for 25 minutes, and you do it 5 days a week, you WILL get results. Unlike Insanity, Shaun has one of the ladies in the video doing modified moves for people that need a lower intensity. Demand for this program has been through the roof, beachbody's website was bogged down all day yesterday with the release of this workout and their new shakeology flavor, so I highly expect it to sell out! When you buy a challenge pack which is a combo of both T25 and shakeology, you get a savings of $90 if you were to buy them separately! Plus the challenge group price is on sale, it will go up $25 and has limited time free shipping. It's only being sold through coaches right now and all my customers get the FREE bonus workout Core Speed. Additionally when you purchase the challenge pack I'll put you in my next 60 day challenge group. Are you ready to make a change?! There's only 7 days left in the month to take advantage of the June promotion where you get a bag of Shakeology for just $10! lasting energy without the crash. Vanilla Shakeology has arrived! Shakeology is a nutrient dense food with all natural ingredients. Who wouldn't want their daily nutrition that tastes like a dessert but has all the health benefits you need to stay healthy, strong, energetic and lose weight! It took years of searching and testing to hunt down a pure, flavorful, and ethically sourced vanilla bean that would meet Shakeology's standards. The vanilla beans come from small farms in Madagascar (an island off the coast of Africa which I've actually visited). Beachbody is also building schools in Madagascar to enhance the educational environment resources for more than 3000 children. 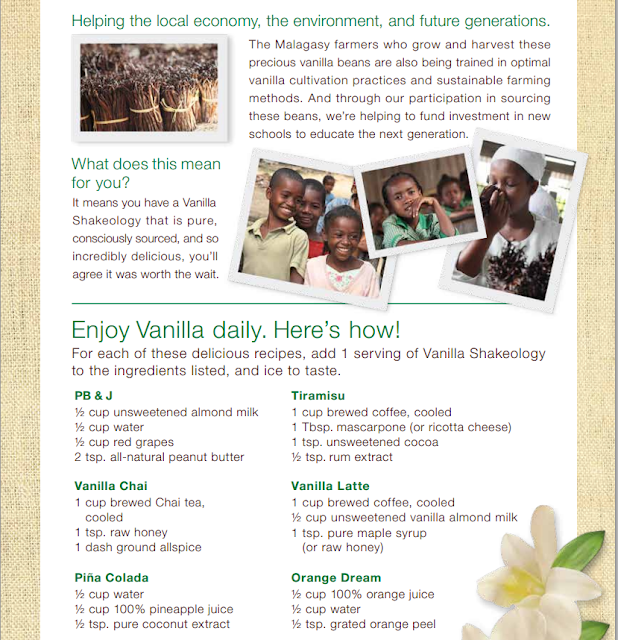 Vanilla Shakeology has 130 calories, 16g of protein, 14g of carbs, 7g of sugar, and 2g of fat. It is gluten-free and they are considering a vegan version in the future. I think this would taste really good with some hazelnut milk! When you have vanilla you can do so many awesome things with it, check out the recipes below. Make this your new starbucks every morning! Order through me by July 7 and shipping is free! This time I'm flying into Madrid and visiting Barcelona, Seville, Ibiza the beaches of San Sebastian and the Costa del Sol region. I'm looking forward to some good sangria, paella and catching a flamenco show! I'm a recreational hiker (carrying my purse at times lol), I do hikes on fairly even surfaces, not more than 5 miles at a slow to moderate pace. On my last hike I was pushed to go faster than I normally do and it had lots of downhill hiking which is hardest on knees. Well for the next 3 days the back of my knees were so sore! I've had this happen before but it never lasted so many days! So I finally broke down and bought some hiking shoes, my first pair! I wanted something that was light and didn't look like hiking shoes but still in the hiking shoe category so I got the Teva Sky Lake. The description says it has a "waterproof seal, the heel has serious shock absorption, nylon shank to keep the foot stable and in control, and the rubber sole designed for grip in multiple environments". I'm pretty excited about my new shoe as for the longest time I would do my easy to moderate short hikes in whatever sneaker I had at the time. 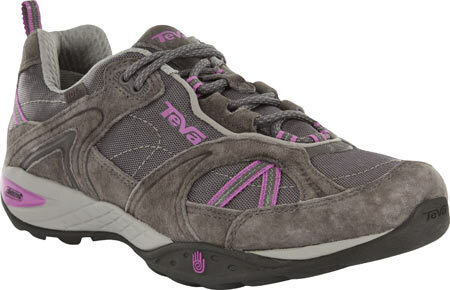 I couldn't wear something ugly and I liked the design of these dark grey shoes with purple accents. Vary your steps and avoid moving in a straight line for the entire hike. Walk in a zigzag pattern up and down hills, walk sideways, or walk backwards since repetitive motions can lead to pain. When going downhill, step slowly, and don't be afraid to crouch down and use your hands. The more slowly you move, the less jarring motions you'll feel in your knees. Add dried pineapple to your trail mix. Bromelain, an ingredient found in pineapple, is a natural anti-inflammatory that will help speed up recovery of knee and joint pain. I took another hike this weekend in my new shoes and my special hiking socks from Thorlo. The walking terrain was jagged, rocky, steep descents and slippery but the shoes supported my feet no matter the trail surface and best of all didn't need any breaking in period. I was happy to have a light weight hiking shoe that fitted the bill for both style and performance. 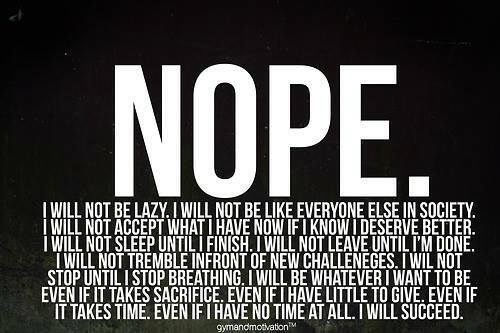 Sometimes you just have to tell yourself nope not going to be lazy and get my workout in, or get an app that gives you financial incentive to workout! 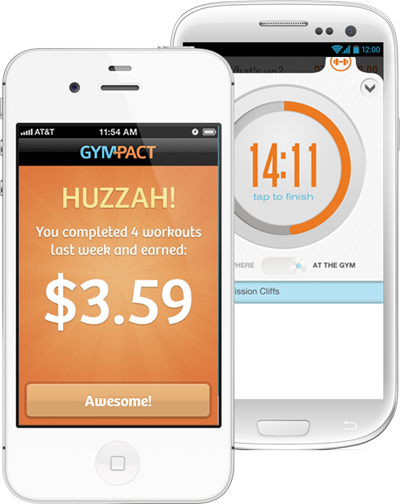 ﻿The GymPact app is available for both the iphone and andorid and the way it works is you pledge dollars to motivate you to workout! So you make a pact to say how much working out is worth to you ($5 or $10 a day) and that monetary kick forces you to keep your pledge. You check in at the gym and if you keep your wager you get paid! You can link your account to the RunKeeper app so all your outdoor running or biking counts towards your goal as well! The best part is there's no list of participating gyms, they can verify any fitness facility that is separate from your home or office. University gyms count, and so do yoga studios, swimming pools, tennis courts, martial arts studios, rock climbing gyms, outdoor tracks, or any standalone exercise facility and in 75 countries. When you're at the gym just hit the Check In button and they confirm via GPS that you’re there! They even have customer service available if you need to dispute a workout not counting as long as you contact them within a 24 hour period. If you do happen to miss a day, they will charge the credit card they have on file for you according to your Pact amount and the number of days missed. But if you meet your Pact, you get a cash reward for each day committed, paid for by those who didn’t get to the gym! Rewards are generally around $0.30 to $0.40 per workout. Now that may seem small, but if you're consistent working out 5x a week every week, in less than a year you can earn enough for a new pair of sneakers! It gets better, if you workout at home GymPact Anywhere uses your iPhone’s accelerometer to count your workout. 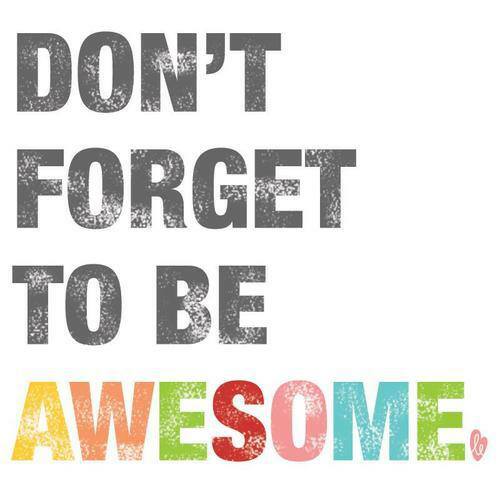 Just keep your phone in an armband and hit 30 active minutes to count your workout towards your Pact. The rules are your workouts must be at least 30 minutes long but only one workout a day counts to your pact. You can schedule breaks for when you go on vacation. If you're sick you just need to send them a letter from your doctor or employer. With financial rewards, it's not a great day until you workout! I like to make my own sauces and I came across this amazing super easy recipe (scroll to bottom) for vodka sauce without the cream! Basically you sub almond milk, nutritional yeast, cashews and white beans for cream and the result is extra protein! I added onion and garlic to this and used fresh spices. The recipe makes 6 servings and then I added baby portobello mushrooms and broccoli on top of whole wheat fusilli pasta. I made enough for lunch for the whole week and put it in separate containers in my fridge so its easy to just grab in the morning. The pasta I measured before cooking to make sure I was only eating one serving each day and whole wheat pasta has a lot of protein in it.The whole bowl is 320 calories, 14 grams of protein and 10 grams of fiber. My morning snack is cashews and my afternoon snack is shakeology mixed with fresh pineapple. Yesterday afternoon my co-worker asked me if I had any candy and I said no and that I never eat candy. He was in disbelief, maybe because the office candy bowl used to be by my desk so perhaps people see me as the source of candy. Anyway I just happened to be drinking my shakeology and said this is my candy! It's sweet and a great afternoon pick me up to fill me with energy! I'm so full after I drink it, I don't even think about snacking. I signed up for my first 5K with some people from church. I don't count last year's Warrior Dash a real race per say, just an obstacle course. 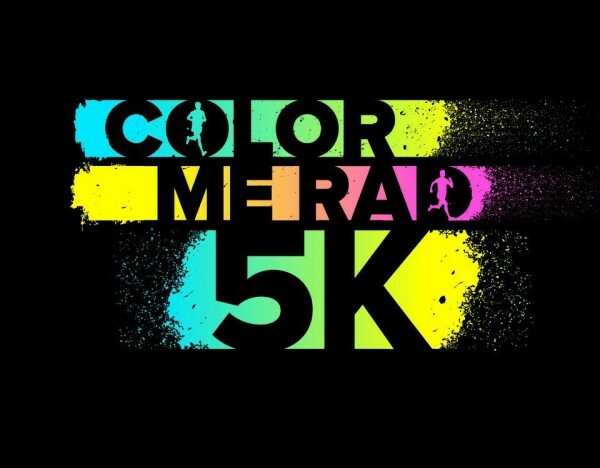 I heard that Color Me Rad is the most colorful 5K you will ever run! The idea came from the Holi celebration in India. There's also The Color Vibe, Run or Dye, The Color Run, and Color in Motion 5ks which are the exact same concept as Color Me Rad race. My friends did the Color Run and Run or Dye and both races gave them a free white t-shirt to wear for the race. The Color Me Rad run gave us free dark blue t-shirts that you can't see dye on so I wore my own white t-shirt. I washed my shirt four times and am still waiting for all the color to come out. The coloring used is colored corn starch, so it's safe, but you still need to protect your eyes with sunglasses which they give you. You need to be sure to shield camera lens because the dust can get inside your camera, I got a lens error message for awhile even though I was careful. I coated my blonde hair with coconut oil otherwise the color could remain for a week, I also wore a headband and bandana for triple protection. Like the Warrior Dash because there's so many people it's done with staggered start times and its untimed. The bombardment of color bombs are sprayed on by people so everyone finishes the race looking like a pack of skittles. Unlike a lot of other races this one was pretty affordable, only $30 and a portion of the proceeds went to the Special Olympics. I'm not a runner, I used to run on the treadmill occasionally until last summer when I bought the wrong shoes and injured my foot. 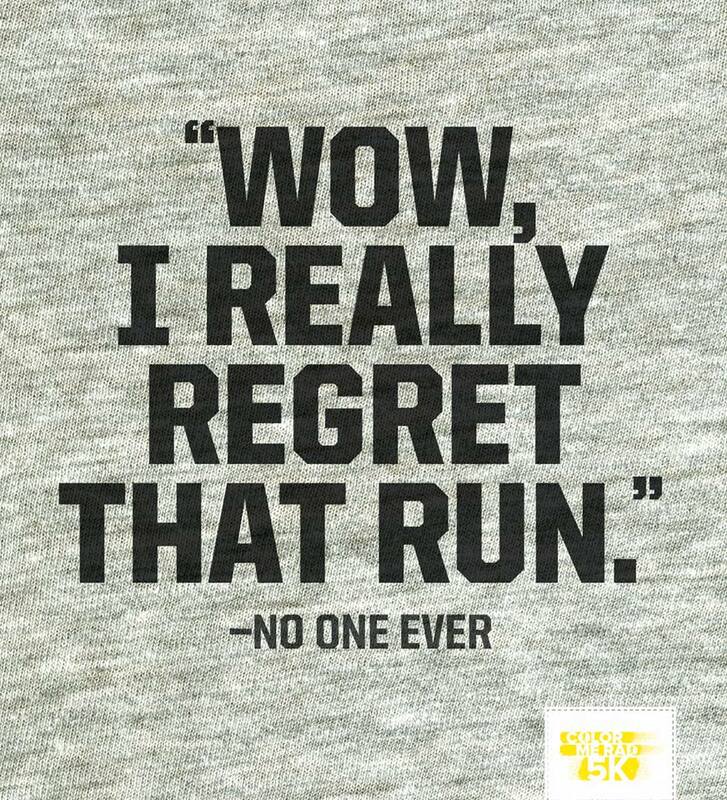 In May of this year I started running again and on my first run could only do 10 minutes! Actually who am I kidding, that was my only run of this year! lol To be honest I didn't train for this race despite having every intention to train for it and even getting a training guide from a friend. Needless to say on the morning of the race I was beyond nervous. I had posted for encouragement on facebook the night before and when I checked in the morning I had people offering a gal some encouragement! 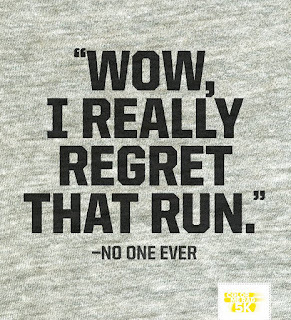 It reminded me that I will never regret going, but will always regret skipping this race. Since I had a lot of energy at the beginning of the race I actually surprised myself and ran the whole race! Lots of people walked it and I just ran right around them! I only wanted pink and purple dust on me but the purple pretty much just looked pink. I ran around the people spraying colored water, so that's why I'm not as saturated in color. In the end I figured I did something fun and fitness related at 9am on a Sunday morning while most people are still in bed. Course I got strange looks from people on the subway on my way home. Get a good nights sleep. If there are cameras en route, smile, wave, and make sure your number isn't covered. My number was on my back at Warrior Dash instead of the front of my shirt and everyone else could find their photo by number on their website, I looked through dozens of pages of their unIDed pictures but still couldn't find me. Have a snack within half an hour of finishing so you're not famished. They gave us water and a mini lara bar, but you should be prepared not knowing what they will offer you. 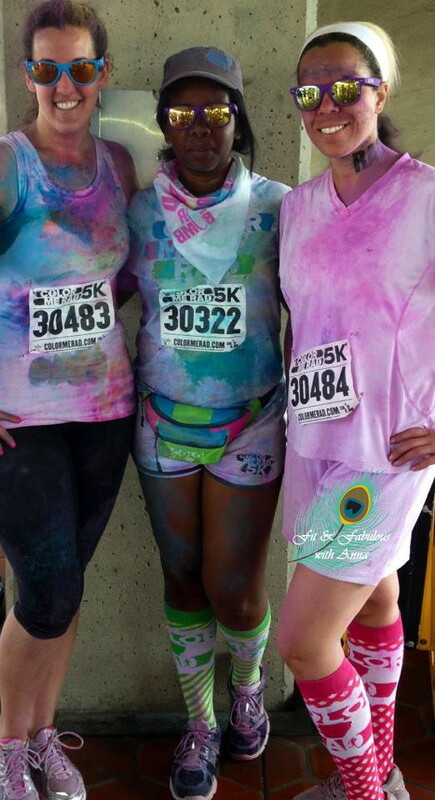 Well, the Color Me Rad 5K was a success! When's the next one? I signed up for the Electric Run! I can't resist a good sale and since the Loft had one I snatched up these cute dresses! If you're looking for some new shoes for summer check these out. I plan on accessorizing the yellow dress with blue jewelry. Do you think the dress on the right is blue or purple? Had a little debate with the saleswomen at the store. One said purple and the other said cobalt blue. 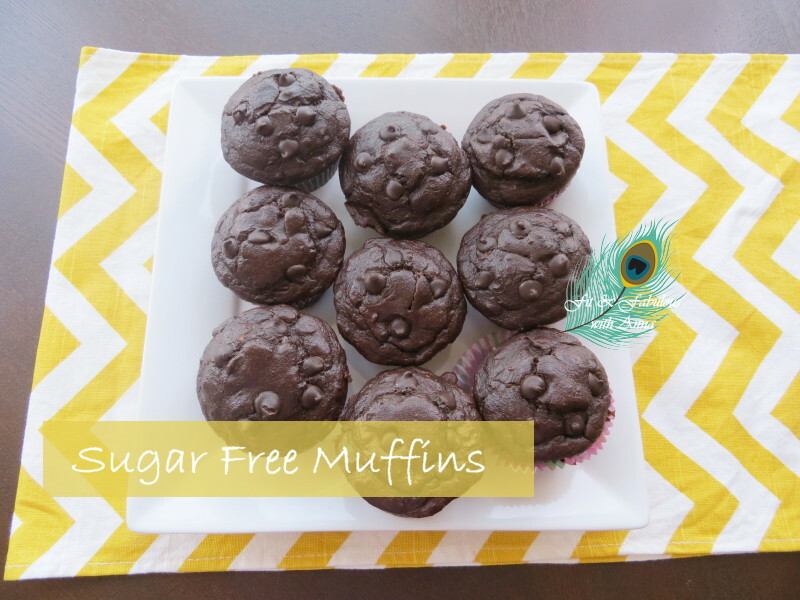 These chocolate muffins are made with no oil, butter, flour or sugar! I'm addicted to Vitatops which are 100 calorie muffin tops! They are found frozen in your grocery store because they have no preservatives. They retail for $5.50 for a box of just four muffin tops. I've tried them all and they're not created equal, I only like the chocolate and carrot cake flavors. The chocolate also comes in a sugar free version that is only available online. I searched through a few copycat recipes online and loved the one from the Dashing Dish. My muffins came out to 129 calories each, and that was because it's a whole muffin, not just a top since I don't have a whoopie pie pan. I do think these would taste better as just a muffin top because the chocolate chips are mostly on the top of the muffin so the top ends up being the best part. I used Hershey's Sugar Free Semi-Sweet Baking Chips which are made with Maltitol and taste just like regular chocolate chips! These muffins had a lighter taste than a regular full fat/sugar muffin, but still good nonetheless! They only have 1 gram of sugar which comes from the natural sugar in apples. Instead of oatmeal I used Arrowhead Mills Organic Oat Flour which is just oatmeal grounded in a blender. I also use it to make protein bars. I used zsweet as my sweetener. Lately I've been making a new version of my oatmeal recipe (be sure to check out the McDonalds diagram at the bottom of that post). I call it tropical oatmeal because there are 3 kinds of coconut in it and topped with mango, although the coconut taste is very light. Since I use old fashioned rolled oats this is an overnight recipe because the oats need to soak to make the cooking time in the morning shorter. This is really an easy oatmeal to make and with all the additives in comes in at 339 calories with 14 grams of protein and 10 grams of fiber. Make a chia gel by mixing the chia seeds with the almond milk in a small container, cover with a lid and shake vigorously. Then come back 20 min later and give it another shake so it doesn't settle unevenly. Mix the oatmeal and water in a microwavable bowl. Refrigerate overnight. I've tried putting them both in the same bowl but I find the chia seeds soak up all the liquid from the oatmeal. Trader Joes sells chopped frozen mango which makes things easier, I will put the mango in the bowl with the oatmeal in the fridge so it defrosts. 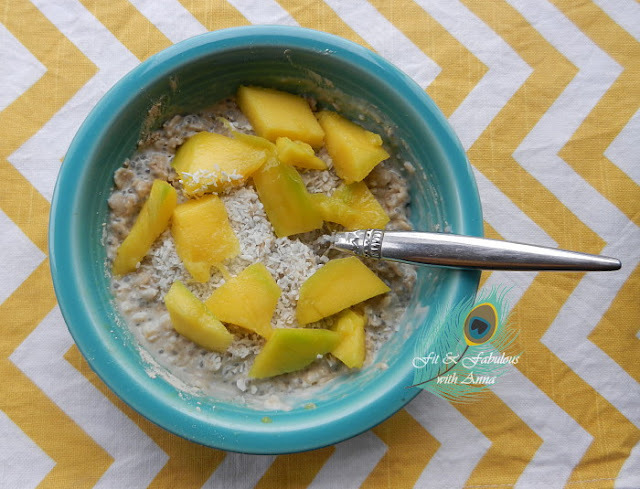 Microwave the oatmeal for one minute (removing the mango beforehand). Add the maca powder, wheat germ, chia gel, and protein powder to the oatmeal. Add the coconut milk and oil to the oatmeal. Top with shredded coconut and mango and enjoy! Why Is This Oatmeal So Good for You? Wheat Germ is the most vitamin- and mineral-rich part of the wheat kernel. Wheat germ is removed during the refining of whole wheat grains to white flour because its healthy oils can go rancid quickly. is packed with important B vitamins, contains lots of fiber, plus has protein. Coconut Milk is full of vitamins C, E and B, it's rich in antioxidants and lauric acid, and your body does not store the fat from coconut milk or oil, instead it uses it for energy. So don't be scared off by the saturated fatty acids in it, your body will easily burn it as fuel. Not eating enough fat can make you fat, so its important to eat healthy fats in moderation. I talked about coconut oil yesterday and coconut water here. Ancient Peruvian women would give Maca to their men before they went off to battle because it contains high amounts of protein and has been known to energize the central nervous system. 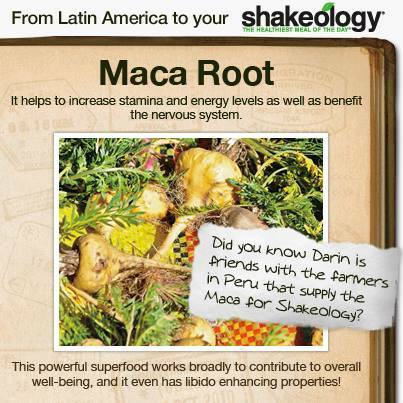 For centuries, maca root has been used to combat stress and fatigue. Tosca Reno recommends using maca for weight loss because it's a strong hormone regulator - helpful for weight loss. 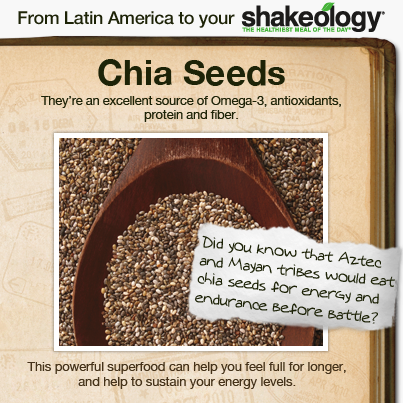 Maca and Chia are also ingredients in Shakeology, which I personally love because its my daily dose of nutrients. I'm sure you're thinking coconut oil is a fat and you should stay away from it, but in fact it's very healthy for you! It's been used throughout Asia for thousands of years and is just recently gaining popularity in America. Research has found that in tropical climates the people who regularly cook with coconut oil have lesser instances of heart disease. Here are some of the wonderful things it does. There was a cow experiment in the 1940s where farmers wanted to fatten their cattle and came up with the idea to feed them coconut oil. Well instead of gaining weight the cattle lost weight! The people of the Yucatan consume a large amount of coconut oil and its been found that they have a faster metabolic rate! There are numerous studies that support this finding. It assists your thyroid in doing its job. If you add virgin coconut oil to your diet, it will help your body burn fat better. I cook with coconut oil, I find it has a higher cooking point so foods cook faster than with olive oil. I add 1/8 ts of oil or 1/2 ts coconut milk to my shakeology to make it taste more tropical! You can use it in place of oil when baking. You can spread it on toast instead of butter. Just one teaspoon will give you an energy boost! Now different brands vary in flavor, I prefer Spectrum Virgin coconut oil. The last time I went to India I remember all the hotels having a small container of coconut oil in the bathroom next to the shampoo, they use it regularly in their hair. I use it as a deep conditioner on my hair. As you can see coconut oil has a multitude of uses and is simply amazing so think of it as a good fat that helps you burn energy! If you're a coffee drinker you can put a little bit in your cup every morning. I put it in my shakeology. If you want to read more about coconuts, I wrote a post about the benefits of coconut water here. 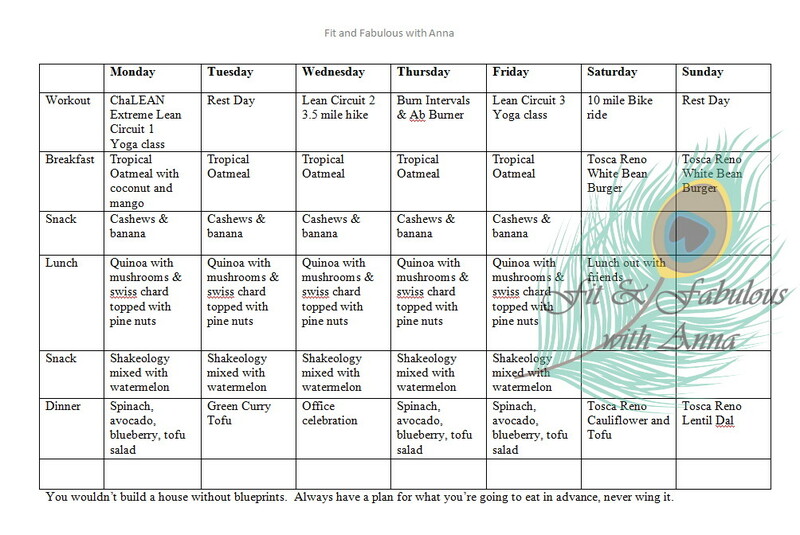 Last week I told you I was following Tosca Reno's stripped meal plan. 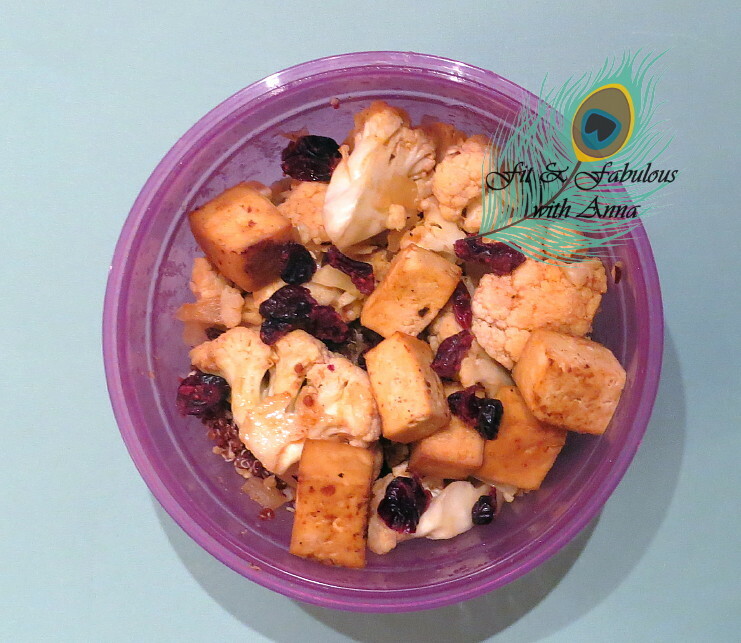 For lunch this week I made Tosca Reno's Cauliflower and Tofu over red quinoa. I changed the recipe a bit by marinating and baking the tofu and used cranberries instead of raisins. Since peaches are in season I bought a box and peeled the skin and put it in my shakeology for my afternoon snack. 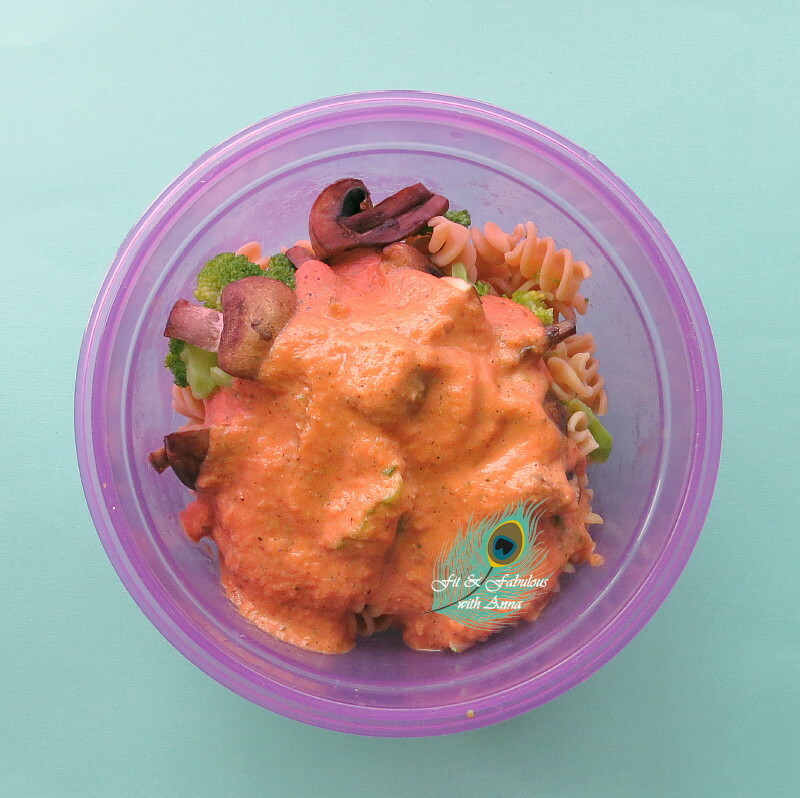 Are you looking for a fantastic salad for the summer? 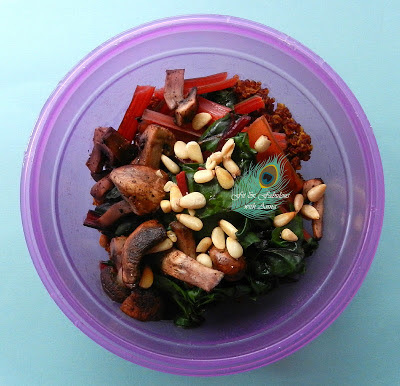 Here's one of my favorite summer time salads! It's pretty simple but so refreshing and takes minimal effort. As you can see my melon baller is one of my favorite kitchen toys! You can play around with the ratio of the arugula and feta cheese to make it more appealing to your palate. It's best to toss it just before serving so the arugula doesn't wilt. Then sprinkle the crumbled feta on top of the watermelon. All the ingredients compliment each so well and it's so pretty to look at too. 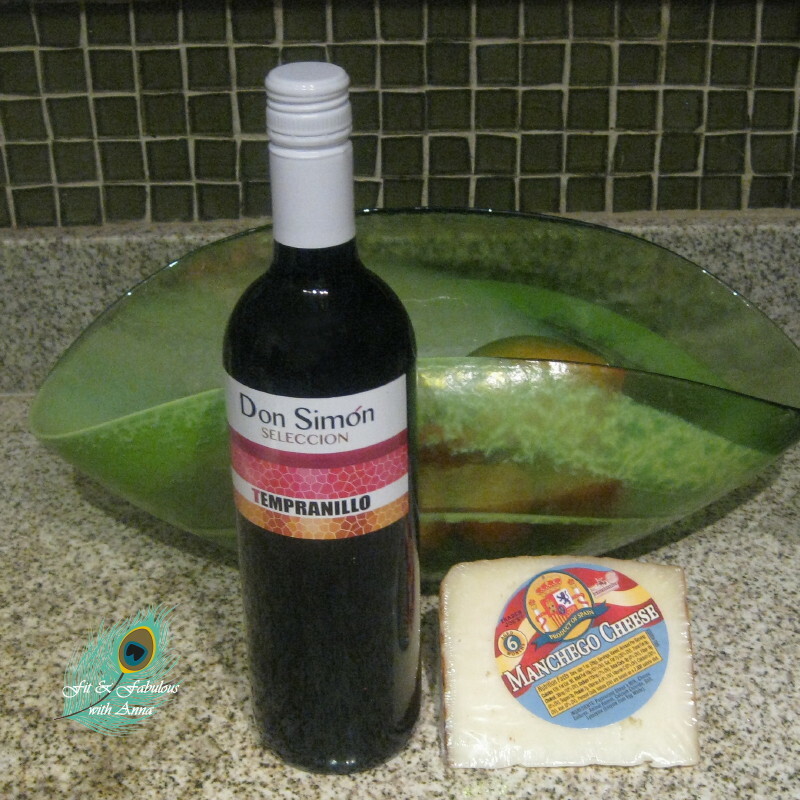 I have no doubts though that you will enjoy this delicious combination. You can add some dressing to it like balsamic vinegar or fresh squeezed lime juice, but I can eat it without dressing. 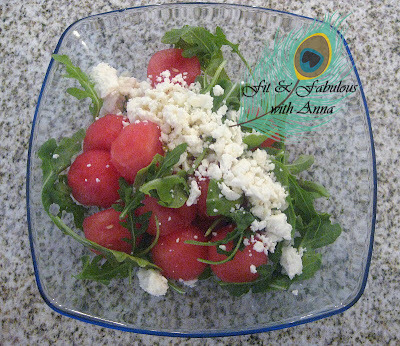 The watermelon is just perfectly sweet to compliment the salty feta. I thought my male readers would be interested in this awesome discount! Les Mills Combat is Beachbody’s first mixed martial arts workout including 7 muscle-defining workouts that include Karate/Kung Fu, Capoeira, Jiu Jitsu, Muay Thai/Kickboxing, Tae Kwon Do and Boxing with the hard-hitting cardio of high intensity interval training to blast calories and help you carve a lean, chiseled body in just 60 days. For the month of June for just $10 more the cost of a bag of Shakeology, Beachbody will throw in a whole fitness program when you buy the Combat Challenge Pack! That includes both the dvds and a bag of shakeology, that’s over $70 of savings if you were to buy the two items separately. Plus you get to be in my challenge group for that extra support and motivation to take your fitness to the next level, ask me how! If you've been wanting to try shakeology, don't let this offer pass you up! 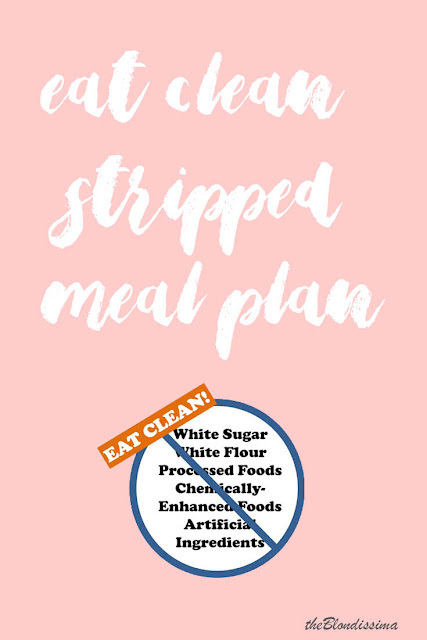 I read Tosca Reno's book Eat Clean Diet Stripped and am doing the plan along with my Clean Eating Stripped Challenge Group. I find it really inspiring to be doing the plan along with a group of people. As a vegetarian I have to be mindful not to get a lot of my calories from starchy sources so I always measure rice/pasta on my food scale before cooking it and I tend to stay away from beans which are high in carbs. I also watch my dairy intake that it's not high in sugar which is easy to do with yogurt! Tosca Reno calls white sugar poison and says to stay away from it. To be honest for me that is hard, so I try to get low cal dessert options. I eat high protein grains like oatmeal and quinoa and add protein powder to my oatmeal to give it more protein. A word of caution, if you're using protein powder read the ingredients of everything you put in your mouth! A lot of protein powders contain chemicals, artificial sugar, and a host of other ingredients you don't want in your body. That's why I love Shakeology, it's completely natural, you can read every ingredient because it's all whole foods and no artificial sugar or chemicals. Eat more! Eat 5-6 small meals each day, spaced at 2 1/2 to 3 hour intervals. Eat breakfast every day, within an hour of rising. Make your last meal three hours before bed. Eat a combination of lean protein and complex carbohydrates at each meal. Eat sufficient healthy fats every day. Chia seeds, avocado, coconut oil, nuts and nut butter. Drink two to three liters of water every day. Carry a cooler packed with Clean foods each day. I bring my lunch to work everyday. Depend on fresh fruits and vegetables for fiber, vitamins, nutrients and enzymes. Adhere to proper portion sizes. Eat only foods that have not been overly processed or doused in chemicals, saturated and trans fats and /or toxins. Tosca has a whole chapter on herbs that are good for weight loss and mentions ingredients that are already in Shakeology: spirulina, reishi mushrooms, maca, and holy basil. This week for lunch I made Tosca Reno's recipe "From India with Love Quinoa Pilaf" (pic below). I talked about the benefits of quinoa in this post, which by the way is gluten free. With it being summer I had to get some watermelon which tastes so refreshing mixed into my Shakeology and I've never felt so stuffed afterwards. I have to say shakeology is a life saver for me as a perfect snack option! Here's my meal plan this week on the stripped plan, I left the weekend open since I will be out a lot. I bring my lunch to work everyday because I think that's really critical for me to maintain my goals. If I buy lunch out I'm not going to be eating clean and will be consuming too many calories. Making my lunch on Sunday for the entire week ensures that I stay on track and save money! Here's my lunch this week - Red quinoa, baby portbellas, red swiss chard, topped with 1 teaspoon of pine nuts. 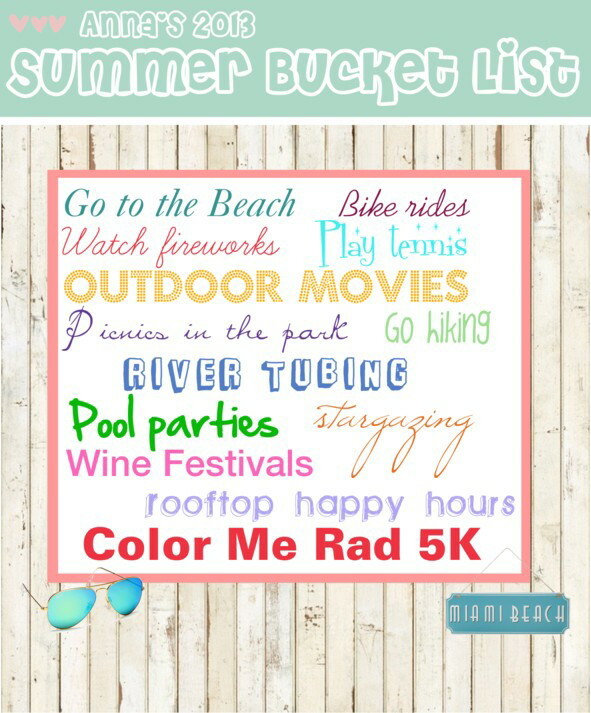 June 1 marks the official start of summer for me! 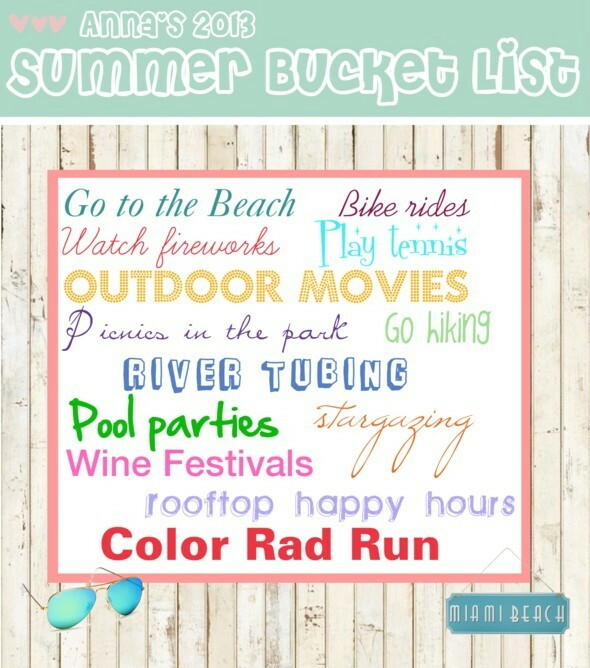 The weather has finally warmed up here and I have a long list of fun outdoor activities I like to do every summer! I've already read the first two books. 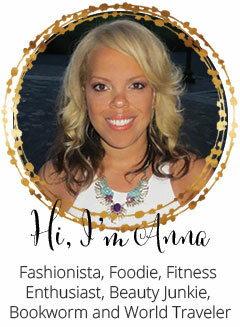 You can now subscribe to my blog and all your favorite blogs on your iPhone, Android or iPad. Click here to download the app for bloglovin. copyright - theblondissima. Powered by Blogger.